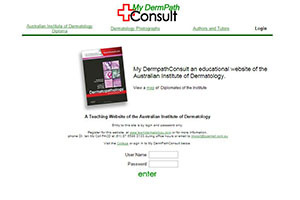 The websites outlined below are educational websites of the Australian Institute of Dermatology. They provide online education in skin disease at different levels of sophistication for Undergraduate medical students and Nurses through to Specialist Dermatology Registrars and General Practitioners. Many are interactive allowing doctors to submit cases for comment and advice from their peers. Please only subscribe to those to which you are entitled by reading the material opposite each website. None of these websites are funded in any form by pharmaceutical companies. The Institute funds everything through it’s own educational endeavors. Studentskinconsult provides an online course in the diagnosis and treatment of skin diseases by Fellows of the Australasian College of Dermatologists and Dermatologists Overseas, based on guidelines of both the Australasian College of Dermatologists and the British Association of Dermatologists. It is available free to genuine undergraduates in Medicine worldwide. To subscribe click here. Skin Consult is a diagnostic teledermatology site and a teaching site for general practitioners. The material is radically different from that for undergraduates and concentrates more on the practical management of patients with skin disease. It uses the same educational teaching techniques as the undergraduate site. Entry to this site is available free to Australian General Practitioners. Derm Consult is a website providing Virtual clinical meetings and examination preparation for Registrars sitting the Fellowship Examination of the Australasian College of Dermatologists. To subscribe click here. 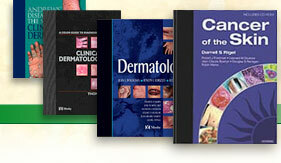 Dermoscopy Consult is a website of the Skin Cancer College of Australia. It delivers the Australasian Dermoscopy course which is directed at General Practitioners and Specialists who wish to aquire a substantial learning experience in Dermoscopy. When you have signed up for the course access to the website can be organised here. Access to the undergraduate website www.studentskinconsult.com is available free to genuine undergraduates in medicine. You can register for it here. Access to the other websites for General Practitioners or Specialist Dermatologists and their Trainees should be done here. As well as providing an education platform these websites also provide an opportunity for cases to be submitted to the website for diagnosis and advice on management by a Specialist Dermatologist. BLOGS Dermoscopy Made Simple uses YouTube videos to describe dermatoscopic features using the terminology first put out by Harald Kittler. It is a comprehensive overview of the subject. Access to this website is free by clicking here. Differential Diagnosis in Dermatology provides a simplified approach to diagnosing skin diseases using 3 questions and 4 mnemonics. You can access it by clicking here. Skin Disease Made Simple is an access website which gives you links to the other educational blogs of the Australian Institute of Dermatology. You can access it by clicking here. Teledermatology is the access website for doctors wishing to book a Store and Forward or Video consultation with Fellows of the Australasian College of Dermatologists utilising the new Federal Government telemedicine item numbers for reimbursement. To access click here. The SCCANZ Dermoscopy Blog is an 1800 case 6000 image 5 year compendium of interesting dermatoscopic cases seen by the members of the Skin Cabcer College of Australia and New Zealand. It is only open to members of the College who can access it here. Atlases Global Skin Atlas is an online atlas of skin diseases, which encourages doctors in various countries to submit images of interesting cases that they have seen. These images are freely available for self-education within the constraints of the copyright. Access to this website is free by clicking here. Global Skin Path Atlas is an online atlas of skin histopathology, submitted by members of the Australasian Dermatopathology Society, which encourages dermatopathologists world wide to submit images of interesting cases they have seen. These images are freely available for self-education within the constraints of the copyright. Access to this website is free by clicking here. Dermoscopy Atlas is an online atlas of dermoscopy images, submitted by members of the Skin Cancer Society of Australia, to aid in the education of doctors in the management of pigmented skin lesions. These images are freely available for self-education within the constraints of the copyright. Access to the Dermoscopy Atlas website is free by clicking here. VIDEOS This is the Australian Institute of Dermatology's YouTube video channel. It contains publicly available videos from the Institute. These can be freely used for non commercial educational purposes. You can access it by clicking here.